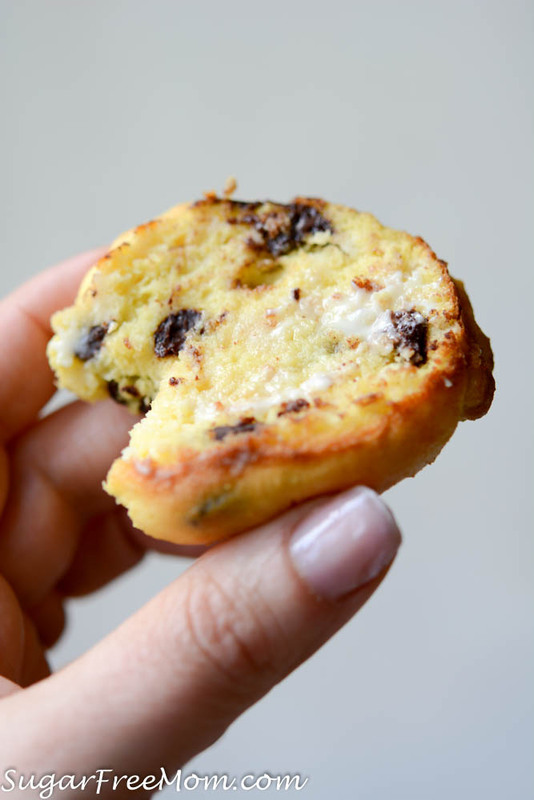 These are the most scrumptious, Keto, Sugar-Free Low Carb Chocolate Chip Muffins made with sour cream! 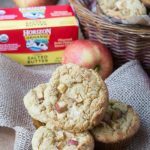 Perfect Texture to traditional muffins, plus Gluten Free and Nut Free! 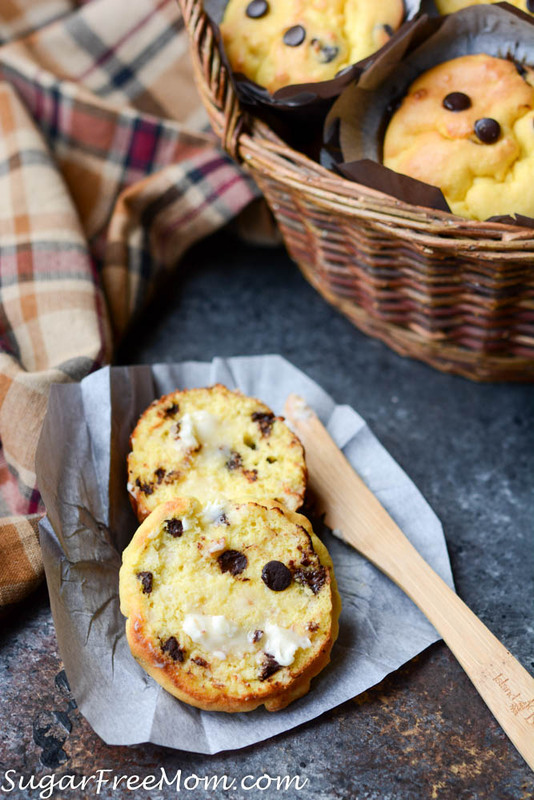 Morning muffins with a cup of coffee is a divine way to start any day. 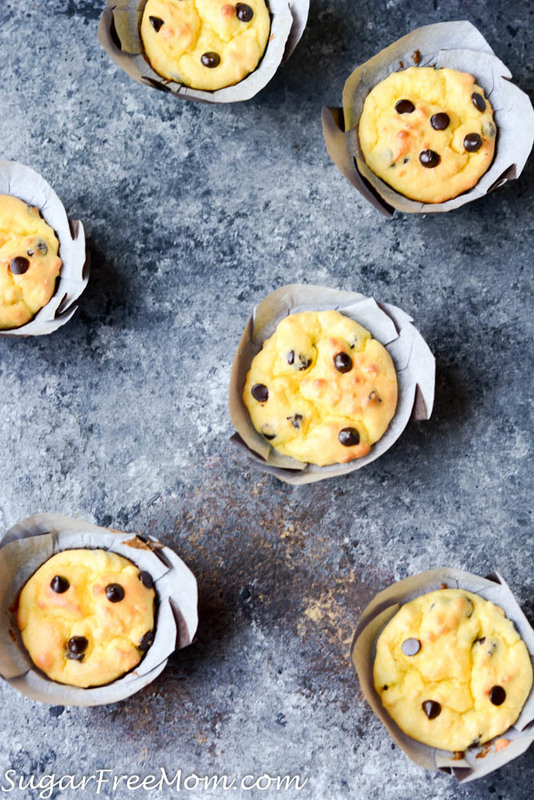 Making muffins on the weekend for the family is also a comforting and relaxing way to begin the weekend. I really love muffins and I mean REALLY. Just something about the texture and then with a smear of butter melting all over a warm muffin, it’s just heavenly to me. I don’t have very many low carb muffins here on the blog, but I do have these Grain Free Cinnamon Roll ones that are fantastic and these Copycat Vitatop Banana Bread Muffins. 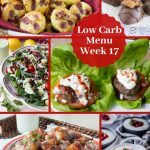 Prior to going low carb, I have some that are sugar free, but not too low in carbs. 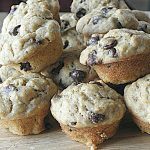 If carbs aren’t an issue and you’re just watching your sugar be sure to check out these Blueberry Muffins, Banana Bread Muffins or these Chocolate Muffins. BUT THESE Muffins are the best muffins I think I have ever made! 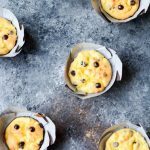 Recently I had made these Keto Blueberry Muffins from my friend Kim over at Low Carb Maven and they were spectacular! 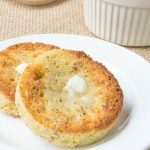 Because my youngest has a tree nut allergy, I often use coconut flour as my low carb flour of choice for family recipes. 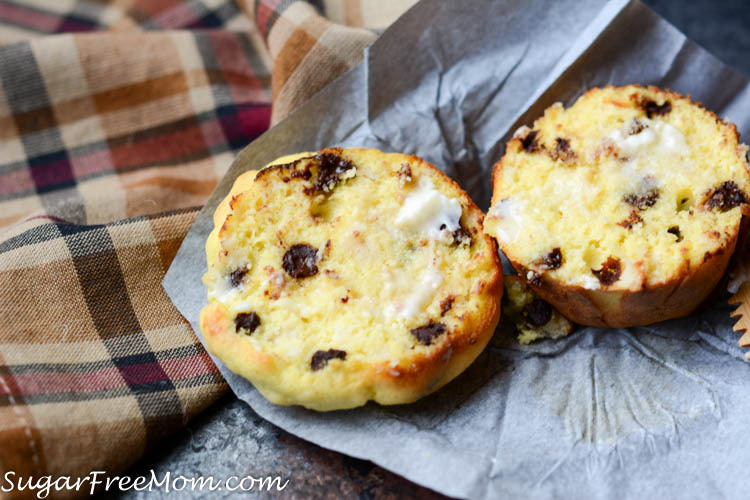 Kim’s muffin recipe uses some cream cheese to get that moistness in the muffin. 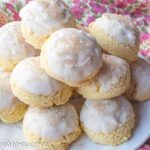 Just like my Cloud Bread recipe, I’m a fan of using sour cream so that’s what I did when I made these. They even are fabulous the next day, not dry at all! I stored mine in the fridge then heated one for 30 seconds in the microwave to warm it then of course, added butter! The base of this recipe can be used again and again, just change out what you add to it. Change out the chocolate chips to blueberries or raspberries even. But the chocolate chips are a nice treat for my family on the weekends. Hope you enjoy these as much as we do! My picky hubby LOVED them as did each of my children, all the picky ones too! In a stand mixer blend the butter, sour cream and vanilla extract. until smooth. Whisk the coconut flour, Swerve, baking powder, xanthan gum together then add to stand mixer on low to combine. Add one egg at a time to the stand mixer until incorporated. Pour in the heavy cream and blend until combined. 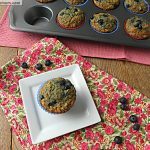 Grease a 12 capacity muffin pan or use cupcake liners. 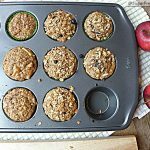 Bake muffins for 5 minutes then reduce temperature to 350 degrees F and continue to bake for 20-25 minutes or until golden and toothpick in center comes out clean. These look great. Do you think I could replace the swerve with coconut sugar? Would replacing the butter with coconut oil change the outcome? I’m not sure as I’ve not tried it, but I think you could and these would still be delicious. Is there a substitute for the heavy cream and butter to make them dairy free as well? Try coconut oil for the butter and possibly coconut milk for the heavy cream. What dairy-free substitute do you suggest for the sour cream? Maybe coconut cream? Hi Brenda! I am not familiar with xanthan gum. I have heard of it, but I never use (I do not even know what it is used for). Can I leave it out of the recipe? Many thanks. It really works wonders in gluten free baking, providing that nice chewy familiar texture that typical recipes have.You could leave it out. 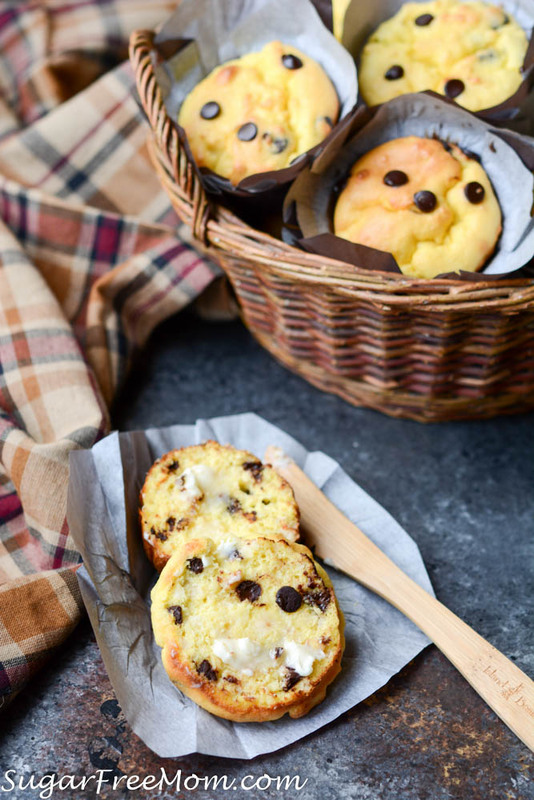 Hi, I made the muffins today, they are great! 🙂 Instead of xantan gum I used the same amount locust bean gum and they worked perfectly. Thanks for sharing the sub you used! Made these again with blueberries this time subbed the chocolate chips for 1 cup fresh blueberries. Delicious! 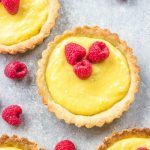 Love that this recipe is so versatile! Made these today and they are fantastic! I was actually shocked…I say shocked at just how good these suckers actually are! I’m noticing that the weight of the coconut flour and any other dry ingredients makes a difference in what program you are using. 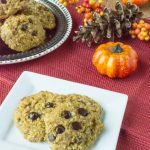 I pay a monthly fee to use myfooddiary.com and I’m able to put in the grams of the flour. It seems like with my fitness pal it only may allow you to use the cup measurements and there is a huge difference. So 1/2 cup technically in liquid 4 ounces right but with weight it’s only about 1.5 ounces so you can see the discrepancy right there. I think mine is more accurate. I actually weigh everything and do the calculations myself using either the info on the packaging or info I get from Calorie Lab. I just plug the info into the daily meal tracker on Atkins and it tallies it up. For this recipe as an example according to Bob’s Red Mill a cup of their coconut flour weighs 112gr and contains 24 nc, adding 4 for the Daisy sour cream I use, .4 for each egg and 4 for the chips I used plus I use a 0 carb heavy cream and the recipe yields 2.9 NC and 221.7 cal, 5.2 protein, 18.0 fat and 3.7 fiber. I actually re-calculate every recipe I do using the weights of the ingredients I actually use and then weigh the resulting dish. That way I can get the counts per 100gr of serving and don’t have to guess and the size of a serving. all that said though, it is a damn fine muffin and I just enjoyed one while typing this with a cup of copy. I look forward to trying some more of your recipes, and thanks for getting back to me. Hi! When do you add the salt? 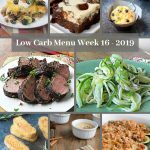 I love your recipes and find them inspirational. I have shyed away from some of the quick breads and muffins, though, because of the number of eggs. Is it possible to get the same great texture with egg whites in place of the whole egg? I’m not sure as I’ve never tried it, maybe just swap 2 or 3 eggs for whites, I wouldn’t eliminate them all. Can almond flour be substituted for coconut flour? I am not a fan of the coconut flour. You really can’t taste any coconut flavor in these. My son hates all things coconut and he loves these muffins. You can’t really sub almond for coconut in many recipes because coconut is so absorbent, the amount of liquid is quite different than using almond. 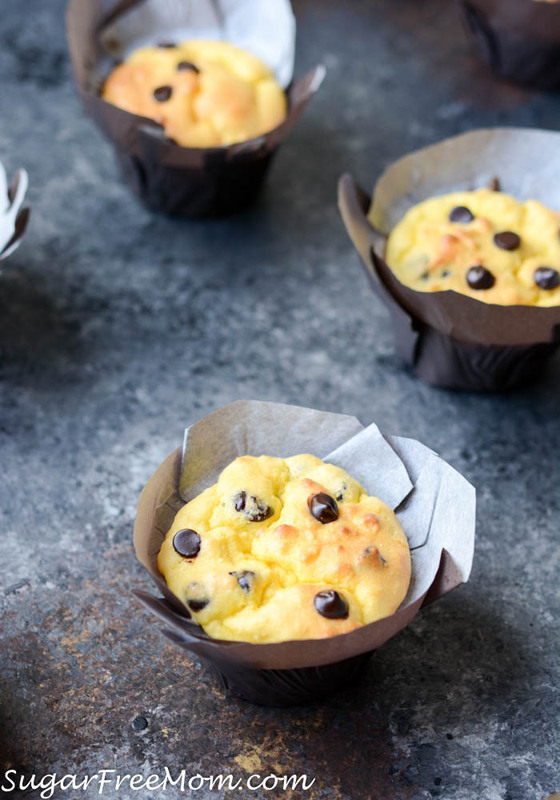 Best to just look for a muffin recipe specifically using almond flour. Sorry about that! If I substitute cream cheese for sour cream would it still be the same amount in the recipe? You could use the same amount, let me know how they taste. I think they might be a bit denser. A “stick of butter” is 1/4 of a pound or 4 ounces. 4 ounces = 113.5 grams. 400 gams ÷ 113.5 = 3.52 So 3 and a half sticks of butter should be close to 400 grams. Hope this helps! I’m going to make these today!!! as a side note by kids have tree nut allergies but have been desensitized by going through OIT oral immunotherapy, look into it, it’s a wondeful treatment and my kids are eating their allergens, tree nuts and peanuts every day now, it’s life changing! Are you using granulated or powdered Swerve ? I’ve used both on their own on a few different times with good results and have also used a combo of them both in one batch. Works well each time! I made these today for the first time and wow! they are awesome! the best muffins I’ve ever tasted. Thank you for a fantastic recipe. Made these they were great. I used cream cheese instead of sour cream, it’s what I had the fridge. Could I substitute whole-milk Greek yogurt for the sour cream? (I’ve made them as written and they are OUTSTANDING. Even my in-laws approved, and they are NOT low-carb eaters.) Thank you! These are very good! I made them exactly as recipe says as far as ingredients. However, my niece thought hers got too brown, so I baked them at 350 for the entire time. I recommend baking them 20 – 25 minutes. Can I make these in mini form? If so, how long would I bake them for? Brenda could you please help me out? 1 cup of coco flour ads up to 180 grams! Almost double on the 100 grams in your recipe. Should I go with the cup our the grams? I’ve never weighed 1 cup of coconut flour on mu digital scale and gotten 180 grams, if I overfill my cup it would be about 130 grams, so I’m not quite sure how you are getting 180 grams. Stick with the 1 cup measurement. I’ve never used xanthan gum…..can you substitute glucoomman?